Matcha is a type of finely powdered green tea made from the leaves of the Camellia sinensis plant, the same species of plant used to make black tea, oolong tea, white tea, and other types of green tea. Used in traditional Japanese tea ceremonies, matcha has become a favorite of tea connoisseurs. Unlike green tea made with whole leaves or leaf parts, matcha's leaf powder is finely ground and doesn't need to be strained after steeping. The vibrant green powder blends into hot water and you drink the entire beverage. In cultivating matcha, the plants are grown in shade for several weeks prior to harvest. After harvesting the plants, the leaf stems and veins are removed and the remaining parts are steamed, dried, and then stone-ground into a fine powder. As one of the few teas that contain the whole leaf, some proponents claim that matcha boasts more antioxidant power than other tea varieties. In addition, matcha is purported to lower cholesterol and blood pressure, enhance mood and cognitive function, increase energy, promote weight loss, and keep blood sugar levels in check. Some people drink matcha lattes and tea as a substitute for coffee. Add four ounces (125 mL) of hot water that hasn't yet reached the boiling point. Briefly whisk the matcha until the tea is thoroughly mixed with a frothy layer on top. ﻿Pour it into a cup. Many studies suggest that green tea, in general, may have health benefits, however, the research on matcha's unique benefits is very limited. Another preliminary study, published in 2014, investigated the effect of green tea consumption on cognitive dysfunction in older adults. After consuming matcha powder daily for three months, participants' scores on a cognitive function assessment were significantly improved. The researchers cautioned that large-scale controlled studies are needed. Matcha contains higher amounts of epigallocatechin 3-O-gallate (EGCG), a potent antioxidant, than other forms of green tea, according to a study. After examining samples of matcha and China Green Tips green tea, researchers found that the concentration of EGCG was 137 times greater in the matcha tea. Although matcha is generally considered safe when consumed in small amounts as a beverage, it's important not to go overboard. Due to the caffeine content, green tea may trigger certain side effects (such as headache, insomnia, irritability, diarrhea, and heartburn) when consumed in excess. For their part, the National Institutes of Health (NIH) warn that green tea may cause stomach upset and constipation in some people. Matcha may contain fluoride, arsenic, and lead, which are absorbed by the tea plant from the surrounding soil. 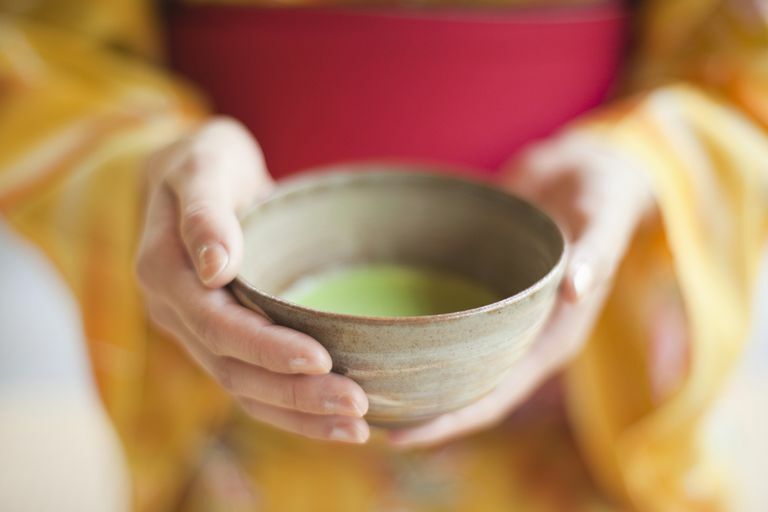 While the NIH cautions against consuming more than five cups of green tea daily, the equivalent amount of matcha is far less because the powdered leaves are consumed. Children and pregnant or nursing women should avoid it. If you're considering the use of matcha for a health condition, make sure to consult your physician first. There's no doubt that matcha can be tasty in tea, smoothies, matcha lattes, or when used in cooking. But because it's concentrated, it's wise to watch your consumption and not go overboard. While it's possible that drinking any form of green tea may enhance your overall health, we can't be as solid about matcha since there's a lack of clinical trials (the kind of research you'd want to see to put full stock in a treatment). If you prefer the taste of regular green tea, there's no reason to switch right now. Guo Y, Zhi F, Chen P, et al. Green tea and the risk of prostate cancer: A systematic review and meta-analysis. Medicine (Baltimore). 2017 Mar;96(13):e6426. Ide K, Yamada H, Takuma N, et al. Green tea consumption affects cognitive dysfunction in the elderly: a pilot study. Nutrients. 2014 Sep 29;6(10):4032-42. Weiss DJ, Anderton CR. Determination of catechins in matcha green tea by micellar electrokinetic chromatography. J Chromatogr A. 2003 Sep 5;1011(1-2):173-80. Willems MET, Şahin MA, Cook MD. Matcha Green Tea Drinks Enhance Fat Oxidation During Brisk Walking in Females. Int J Sport Nutr Exerc Metab. 2018 Jan 18:1-21.